It’s the time of year for tie-dying! Oddly enough, I’d never actually tried tie-dying before this. I’m happy to say that my first try happened to go well! I’ll be honest and let you know they didn’t turn out exactly how I pictured them (the traditional tie-dye style), but in this case, it was a good thing. The trick for this pattern is to use a cotton polyester blend shirt. The dye does not sink as well into this type of shirt, leaving more white as a result. Below are some step by step photos of how to complete this DIY. As you’ll see, I attempted to use the traditional “twisting of the shirt” technique, but it didn’t turn out perfectly in both t-shirts. The twist definitely helped to create a pattern though! 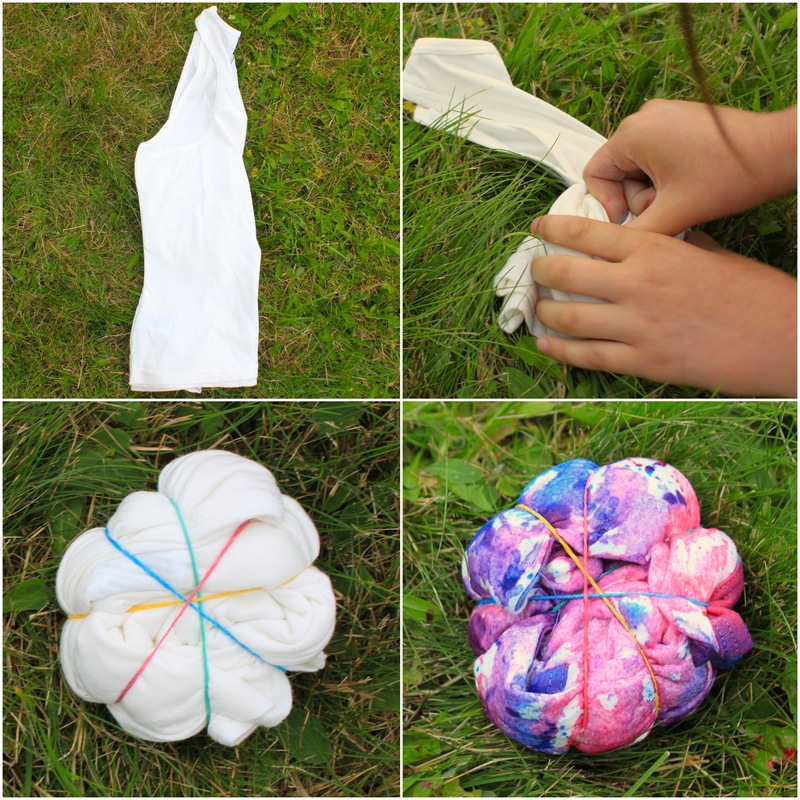 Pinch the middle of the folded shirt and twist, until you’ve created a ball (almost like a cinnamon bun). Secure with elastics. Put on your rubber gloves! Mix each dye in separate containers with 1 1/2 cups of water and 1/2 tbsp dye salt. Cover and shake to mix. Place your shirt ball onto a protected surface. Begin to pour your dyes over the shirt however you like. Once one side is completed, turn the shirt over and repeat on the other side. Place the shirt in a plastic bag and leave for 5 hours. Unwrap your shirt and rinse under water until it runs clear. Wash and dry the shirt. Fold the shirt in half lengthwise. Repeat steps from the single swirl above. 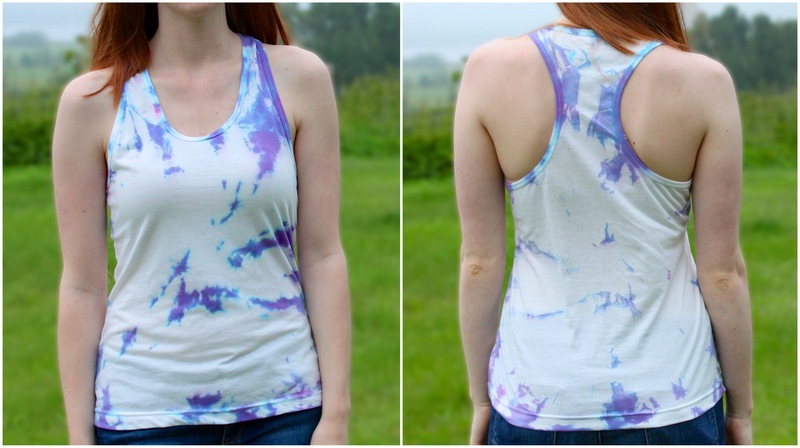 Now go out and sport your fancy new DIY shirt! I hope you enjoy this tutorial and share it with your friends. Gracie and I had a great time making these, and it was wonderful to have her company. She’s a pretty awesome cousin. Check out her blog here. 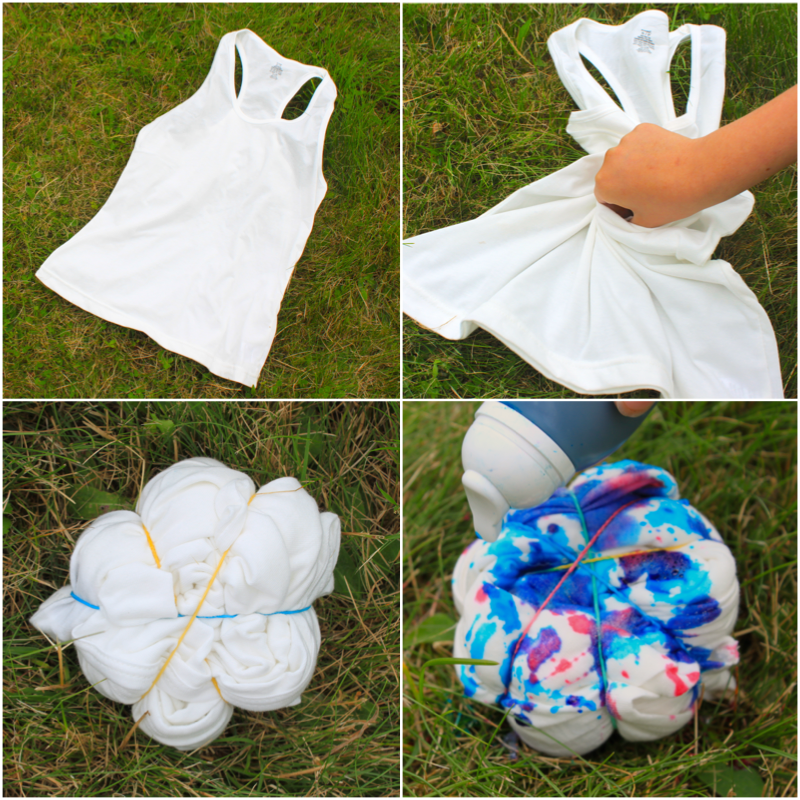 This entry was posted in DIY and tagged DIY, dye, galaxy, recon, shirt, summer, tie. Bookmark the permalink.